The data management on your phone could be a tedious task. You must secure or backup your data because; you can lose your data due to unforeseen circumstances. Although, you have options to restore data on your iPhone; you can restore your iPhone data from either iTunes or iCloud. But, that is possible when you have a habit of backing up your data on these two applications. When would you need to restore iPhone from iTunes backup? If you updated your iPhone with the new iOS or you had to reset your iPhone due to some circumstances like- your phone was disabled, or you accidentally lost some files on your iPhone; you have to restore your data from iTunes or iCloud. User Guide: How to Restore iPhone from iTunes? If you want to restore data on your iPhone, you don’t need to worry about the complications. It is easy to restore your data with the help of iTunes and iCloud. Here, we tell you about restoring your iPhone using iTunes. Follow these simple steps. Step 1- Open iTunes on your Mac computer or some other computer you use to create your backup. Step 2 - Connect your iPhone to the computer using a USB cable. Step 3- Your iPhone information will be displayed on the iTunes interface. Select your device. Step 4- There, you will see an option of "Restore Backup". Click on this option to restore your backup from iTunes. Now, this option will not restore deleted files from your iPhone. This is because you didn’t create a backup of it. It will only restore from the last time you synced it with iTunes. Step 5- Click on the files you wish to restore. After the restoring process is complete, restart your iPhone. Step 6 - Now again sync your iPhone with iTunes to keep the data up to date. The problem here is that this one is a very long and cumbersome method that you would like to avoid. What if there was an easier way out to help you restore your iPhone from iTunes quicker, in just a few simple steps? * What if iTunes Can't Recognize Your iPhone? Now, if you wish to restore your deleted files from your iPhone, you can use an amazing software iPhone/iPad/iPod Data Rescuer. This will help you restore the deleted files for which you didn’t create a back up on iTunes. Follow these simple steps to restore iPhone with/without iTunes. Step 1 - Install the software and open it on your computer. Step 2- Connect your iPhone using a USB cable. 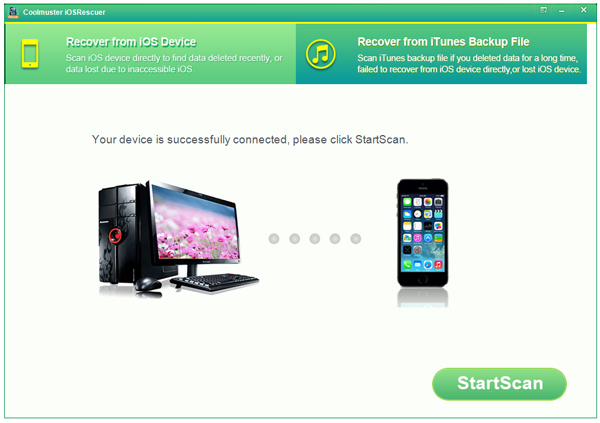 Step 3- On the software window, click on the option "Recover from iOS device" and then on "Start Scan". Step 4 - All the files will be displayed on the screen, including the lost ones as well. Step 5 - Choose the files you wish to restore, and click on "Recover" tab. Your files will be restored on your iPhone. Step 6- If you wish to wish to restore from iTunes, click on "Recover from iTunes backup file". Step 7- Choose your device from the displayed devices on the screen and click on "Start Scan". Step 8 - All the files will be shown for the chosen device. Select the files you wish to restore. Step 9 - Click on "Recover" tab and all your files will be recovered on your iPhone. That is all that you need to do to recover your iPhone from iTunes - this all-in-one tool makes the entire process simple and seamless. You don't have to worry abut anything - let this iPhone/iPad/iPod Data Rescuer software help you recover and restore your iPhone in just a few clicks. What if iPhone Won't Restore? Where to View iPad Backup Files?